The Story of You. An undated 13 month keepsake calendar for baby. The second printing of the second baby calendar from The Future Mrs. Darcy is here! All the greatness of Baby's First Annual Report in a totally different skin. Kind of old newspaper-y or faded official document-y with a tiny splash of hipster and pinch of crazy this calendar is sweet without rotting any of those baby teeth your kiddo will work so hard on. This calendar was meant to give you an easy and, dare I suggest, fun means to document the very first year of your little one’s life. 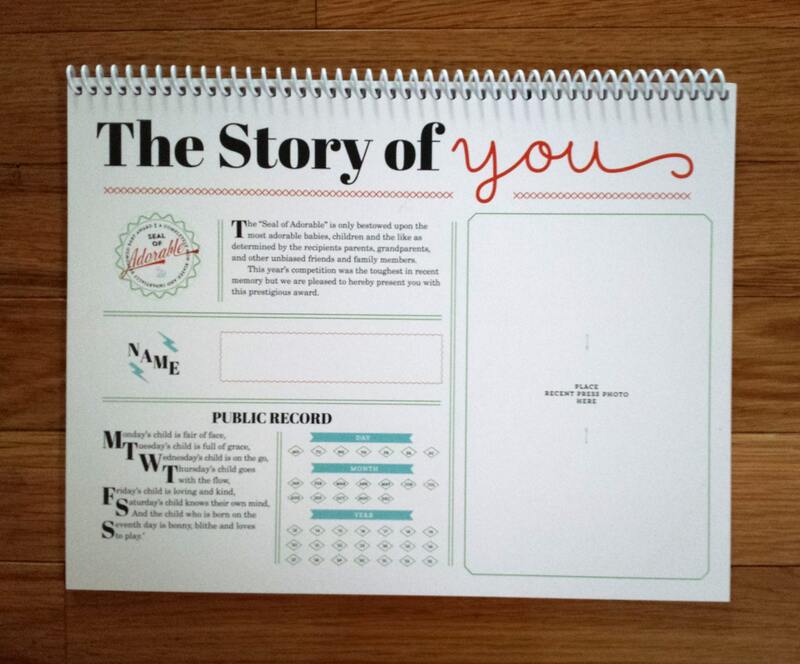 Beginning with a page to chart important birth facts there are then 13 blank months, each with a section to document vitals, an area to free write “All About Baby”, and a place to affix a photo of your little cutie pie. Categories such as “Milestones,” “Tricks,” “Foods I’ve Tried,” and “From the Mouths of Babes” are added in later months when your baby can do something other than stare at ceiling fans. Unlike other baby calendars there are easy fill in areas including such gems as "Eye Witness Testimony on Sleep Habits" and "Approx. Percentage of Food on the Floor". I have tried hard to leave the calendar untethered to traditional family types in the hopes that this will be loved and spit up upon by ALL families. Very nice product! Totally recommended for your record keeping! Love it! I bought your other baby calendar for my son and adored it. Now I got this for my SIL!! Custom orders are printing from California and shipped USPS Priority within 72 hours. Calendars are pre-printed and ship within the week. Orders take 72 business hours to print once the final proof has been ordered then are shipped. Please see "shipping policy" to find out more details.